Hello blogging friends. The 4th of July will soon be here. I have only a few decorations displayed for the holiday and below you can see them. A while ago I shared with you a simple recipe for apple pie. 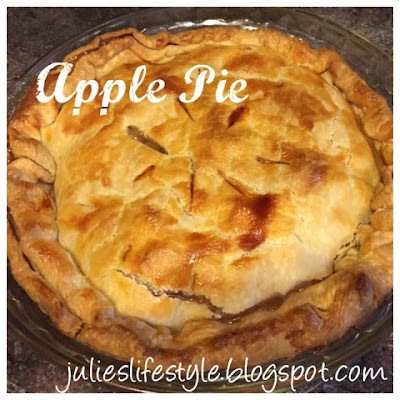 I decided to share this easy and delicious apple pie recipe with you again. This is the perfect dessert to bake for any bbq, party, or summer entertaining. I hope you enjoy this apple pie as much as my family! Preheat oven to 425 degrees F. Unroll pie crusts and press crust into pie plate. Fill crust with 1 can of apple pie filling. Place pie crust on top of apple pie filling. Press down edges of pie crust. Lightly beat egg with a dash of milk. Brush egg mixture onto the edges and top of the pie. Place pie on baking sheet and bake 25 to 30 minutes or until crusts are golden brown and fruit is bubbling. ** You can use any pie filling you like such as blueberry, cherry, and peach. For all of my American blog friends that celebrate the 4th of July, wishing you all a happy and safe holiday! Jess and I will see you all back here on Monday for Cooking and Crafting with J & J Link Up! I love the Dollar Tree! I can always find something interesting there. And hey, Julie you stole my pie recipe.lol. I use two cans of filling instead of one. And those Pillsbury Pie Crusts are life savers. I never can get my crust to turn out like i want it to! I put up my patriotic decor for Memorial Day and leave it up through Labor Day. It's perfect for summer. We do celebrate a bit on July 4th but it's usually low key. We go to our town's parade and maybe do some cooking on the grill at home. I hope you enjoy your weekend! Have a great 4th, Julie! Your decorations look so festive! I really need to look into getting some fun bunting for the front porch. I don't have much in the way of 4th of July decorations. The apple pie sounds great right now. Wish I could sit down with you have pie and coffee. Hi Julie. I love buying decorations from the dollar tree store. You patriotic decorations are beautiful!. Thanks for sharing the Apple pie recipe. Have a great Fourth Of July. Happy 4th to you Julie. Nothing say Happy 4th of July like Apple Pie. Hi Julie! Oh, that apple pie is beautiful and I am going to make this one for sure! Happy 4th and it's always so nice to have you visit me. Happy 4th to you, too, Julie! I don't really decorate for the 4th, but I did stick a couple of little flags in a flower pot, hoping to do double duty by keeping the squirrels out, and being patriotic! Apple pie and America -- a perfect duo! Hi Julie, Happy 4th of July to you too. Love your decorations and the pie recipe is great. I have made this one too. Yes, I do a bit of decorating for the 4th too. Your decorations are cute. I used to decorate for the 4th but we didn't this year. Hello, I always love the Red, White And Blue!! Happy 4th, Julie! Your decorations are pretty and patriotic! Love your decorations, Julie! There is nothing like apple pie to celebrate a holiday and a time with loved ones. It's my hubby's favourite. Thanks for sharing and Happy 4th of July, Julie! Hi Julie, nothing beats a good apple pie. Your decorations are so pretty Gotta love the dollar store. I hope your 4th of July is fabulous! Thanks for sharing your 4th of July at DI&DI. Love the apple pie recipe! Thank you. I like simple! The pie sounds lovely - and i've used those pie crusts many, many times! Thanks for sharing with us at Throwback Thursday! Julie, Apple pie is the perfect treat for the holiday! I hope you enjoyed yours :) Thanks for sharing your recipe with us at Brag About It and I appreciate your visits too! Pinning to share. Have a wonderful week ahead. I hope you've enjoyed a wonderful holiday, and that pie looks amazing! Thank you for sharing the recipe at The Really Crafty Link Party this week. Pinned! 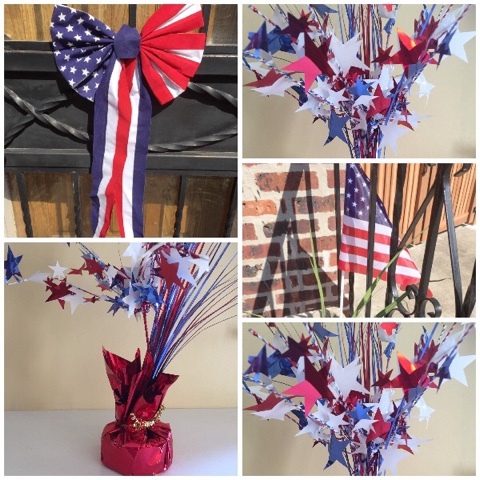 Your 4th of July decorations look beautiful, Julie and your Apple Pie looks delicious! Thank you for being a part of our Hearth and Soul Hop Link Party. Oh yum, yum! Apple pie is kind of a must on the 4th of July! Thank you for sharing this at the Happy Now link up!